Hit the road in a new set wheels. When your tread is wearing thin, we have affordable solutions for you. 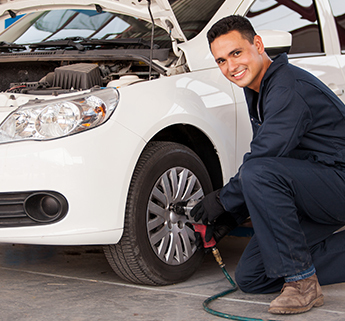 Wayne's Auto Repair ensures you are ready for the road by offering quality and affordable new tires, wheels, and rims. As a full-service tire shop in Powell, OH, we carry many top brands for cars and trucks of all makes and models. The rubber really hits the road when you rely on us for tire services. Depend on our ASE mechanics to help you select the right tire for your needs, your vehicle, and your budget. Are your tires wearing out? Tire wear happens for many reasons: improper tire inflation, lack of maintenance (such as tire rotation), and simply bad tires. Premature wear on tires is also the result of improper wheel alignments. Whatever the reason for the tire problem, you can depend on us to outfit your vehicle with tires that last for many, many miles. In addition, we determine the source of the premature wear and fix it. Choose the most popular and reliable brands when you're searching for tires. We carry many different sizes at various price points. All of our tires come with mileage warranties as well. Our experienced staff performs a complete assessment of your car and your needs to guarantee the best possible set of tires. When providing tire replacement, we ensure you have the right set of wheels for your vehicle and ones that last a long time. Is It Time for a New Set of Wheels & Rims? If your wheels are worn, why not replace them? We offer quality wheels at affordable prices. New wheels improve the value and appeal of your car or truck. Let us know what you want. Because we are skilled at our trade, we can find the perfect wheels for your car and install them in a short time. Improve your car's appearance and its performance with new wheels and rims. Give your ride an upgrade by installing rims that suit your unique taste. They not only give your vehicle an assertive presence on the road, but they add more flair to your ride. Contact us for assistance if you need new tires for your car or truck. We proudly serve customers in Powell, Lewis Center, Delaware, and Dublin, Ohio.